I love to learn and experiment with new techniques. 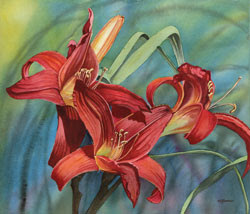 This painting, Red Lilies, was developed by masking the entire area of flowers and foreground leaves, then pouring paint over the paper to develop the soft background textures. I used a little brushwork once the background was nearly dry. After thoroughly drying the background, I removed the masking and painted in many layers of texture and color onto the flowers. This painting won a purchase award at an exhibition last year. The print has been a favorite at art shows. My art show season begins on Mother's Day weekend. You can see my latest work at the Birmingham Fine Art Festival May 10 - 11, at Shain Park in downtown Birmingham. Stop by and say hello if you are in the area!